The development of the oil pipeline that will link Kyaukpyu’s Arakan State port to China will start from January 30. However, many local residents want to protest against it due to the damage to the environment and land seizures due to the inauguration of the project. According to local people, there is a large group of police being deployed to the island. They will be there to protect the locals and Vice President Nyan Tun at the deep-sea port oil pipeline opening. Maday Island Development Group leader Tun Kyi confirmed that the opening ceremony would be the time to air grievances. There are many who worry that oil spills will happen and damage the water. Other environmental groups are concerned for other reasons. Complaints over the construction have been shared by the Madae Island villagers for a number of months. It is not just the environmental destruction that they worry about. They worry the Kyaukpyu Special Economic Zone will threatened the livelihoods of the local people, without offering any of the promised economic benefits. 10 community leaders were jailed for three months in 2013 when protesting against the pipeline. There are still many waiting to receive compensation for their lands that were confiscated due to the project, according to Tun Kyi. He said that the fishing work in the village would be destroyed due to the ships coming into the port. The Arakan State chief minister was alerted to the problem, but Tun Kyi does not believe he really cares. He has said that the locals would not be affected. However, he has not shared the arrival and departure times of the ships, and that is something locals require. The locals were instructed by the District Fisheries Department not to fish between January 20 and 31. The fishermen will need notice for any future vessels arriving. To help placate the protesters, Maung Maung Ohn, the Arakan State Chief Minister, and Zeya Aung, the Union Energy Minister, visited islanders and gave away fishing nets and phones. Three phones worth about US$108 (110,000 kyats), were handed to Tun Kyi, a village monastery abbot and a community elder. The fishing nets were handed to each household and are worth about $3.90 (4,000 kyats). The fishing nets were not suitable for their region, and Maung Maung Ohn said that he would return with new nets. The village was given $9,775 (10 million kyats) instead. A number of locals used the visit as a chance to share concerns over the possible environmental damage and the traffic that would occur in the port. Tung promised that systematic measures would be put in place to help protect the environment. The Zin Run Yang, a Chinese tanker, would be docked at Kyaukpyu. It has 135,650 tons of oil, 49 percent of the investment for the Kyaukpyu deep-sea port comes from the Myanmar government, with China funding 51 percent. Shipments of oil would be channelled from Africa and the Middle East to Yunnan Province in China through the pipeline. 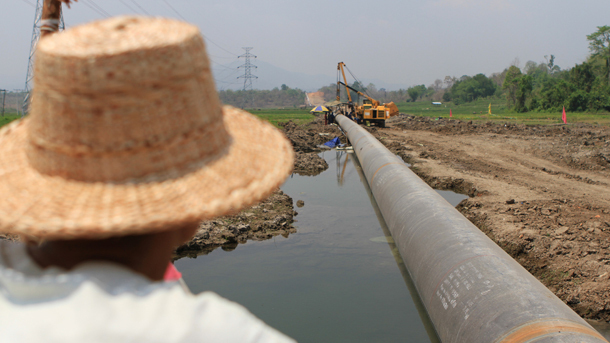 It will work with the Shwe gas pipeline. This is a joint venture for the China National Petroleum Corporation (state owned) and the Burmese Government. It is thought that Burma will gain $22 million per annum from the pipeline. The Burmese and Chinese agreed on the gas and oil pipelines in 2009. The operations for the gas pipeline started in October 2013, leading to many being concerned over the low petrochemical demand in Yunnan Province over the following months. The long-term viability of the project was questioned due to this.